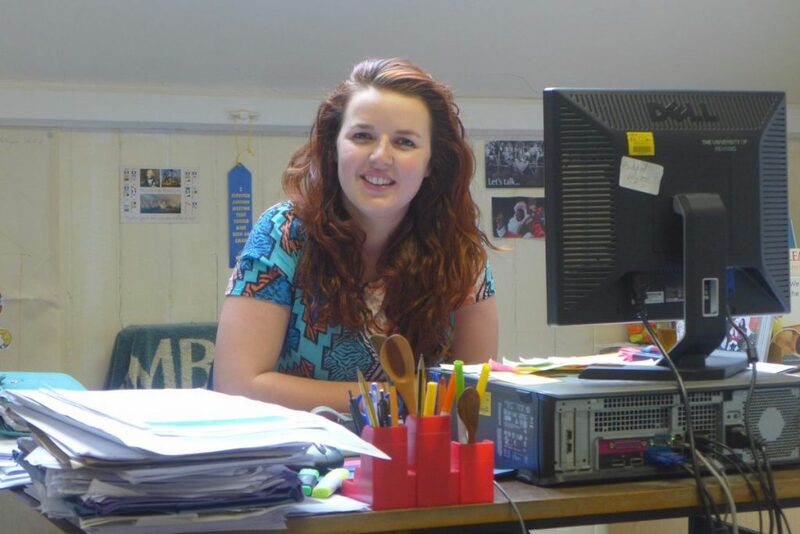 Daisy tells us about her work placement at MERL and the benefits of volunteering after university. The question of what to do with my life after I graduate has been particularly pertinent this week as, on Tuesday, I received the results of my history degree. I got a first, in case you were wondering. Even if you weren’t wondering, I am very pleased to be able to tell you that! Nonetheless, from all the many horror stories I’ve heard, the real world of jobs and careers is a scary place at the moment! So I decided that during my final few weeks in Reading, after the post-exam celebrations calmed down, I would do some work experience that would (hopefully!) help me decide what I want to do in the future. As a history student, the Museums and Heritage sector is an obvious one. I’m fascinated by everything and anything to do with the past and I’ll never turn down the opportunity to work in a beautiful historic building! MERL definitely delivered on both counts. Although the museum itself was closed I could still enjoy the splendour of the Palmer’s entrance hall and got a behind the scenes look at the archives and art collections. During my week’s work placement I tried out a number of different roles at MERL. I worked on the front desk, welcoming visitors and doing stock checks of the museum shop. I did some research for the MERL Players’ upcoming production (which will look at the lives of different rural residents). My favourite story was of a Land Girl who was a tractor expert but who sometimes found it hard to make the 7.30am start after a night of dancing! 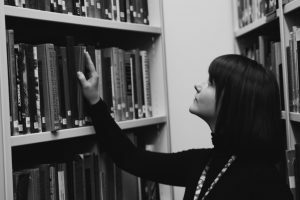 I staged a takeover of the MERL volunteer twitter feed, updating followers on what I was up to and giving a behind the scenes insight of MERL and Special Collections. Finally, I transcribed some oral histories of British farming. I enjoyed every role and it was lovely to be able to try out lots of different things. From what colleagues have told me, that’s the joy of a smaller museum – you can mix and match different tasks that interest you and can always find something useful to do! There is something lovely about the atmosphere of a museum, too. While in the office I’ve been shown, and vigorously encouraged to try, hand creams made from Victorian recipes! In the staff room I’ve been part of National Cream Tea day (i.e. eating lots of scones) and have drunk a ridiculous amount of tea! My week at MERL has given me an insight into the world of museums and heritage and, I can confirm, I definitely still want to work in this field! Personally, my dream museum job would be in marketing or PR because I really enjoyed having the opportunity to show MERL off in its best light and thinking of innovative and interesting ways to engage people. However, what MERL has taught me is that I could enjoy almost any role in a museum environment. As long as the people are fun, the tea is flowing and the nerdy history discussions are never far away, I’m happy! 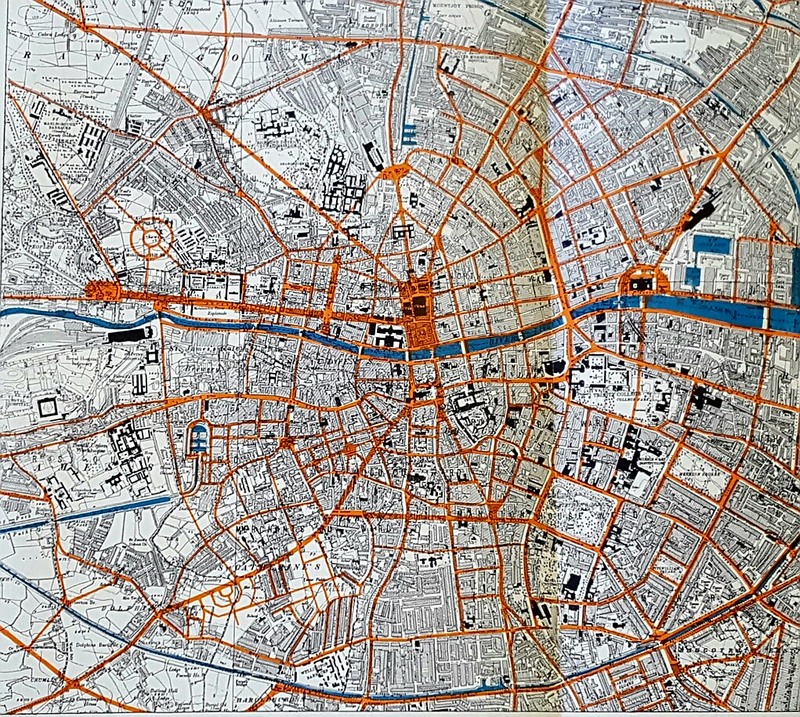 This post highlights Dublin of the future: new town plan by Patrick Abercrombie, Sydney Kelly and Arthur Kelly (University of Liverpool Press, 1922) – a title from our MERL Library Landscape Institute collections with intriguing context and provenance. Patrick Abercrombie (1879-1957) was a town planner active in the interwar period. 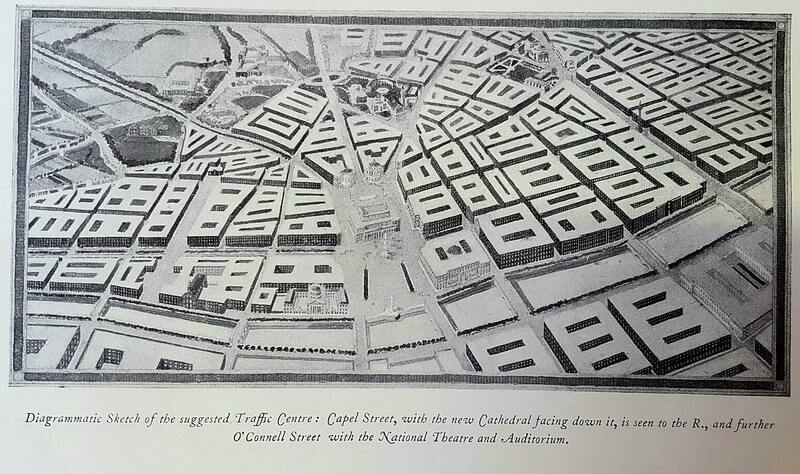 He played a leading role in planning for the redevelopment of a number of urban areas, such as London and Plymouth. Abercrombie retained a love of traditional landscapes and historic towns. His 1926 article ‘The preservation of rural England‘ published in the Town Planning Review led to the foundation of the Council for the Preservation of Rural England (CPRE – of which we hold an archival collection. The members of the Institute feel that with the recent change in National circumstances a new epoch has begun, and that the present is a most opportune time to arouse the interest of the Citizens, hence it is that the design and report prepared… in the year 1916, now appears. Interestingly, the copy of Dublin for the future we received from the Landscape Institute has been inscribed with the signature ‘T. W. Sharp’ on the front endpaper (left). 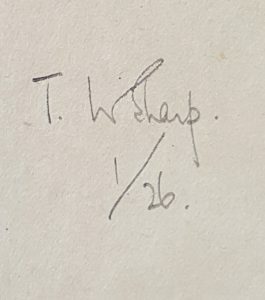 It seems a fair assumption that this signature belongs to Thomas (Wilfred) Sharp (1901-1978). Thomas Sharp was a town planner and writer, who we can imagine was was inspired by Abercrombie’s work. Sharp shared Abercrombie’s enthusiasm for the landscape and its protection (he was President of the Landscape Institute, 1949-1951). 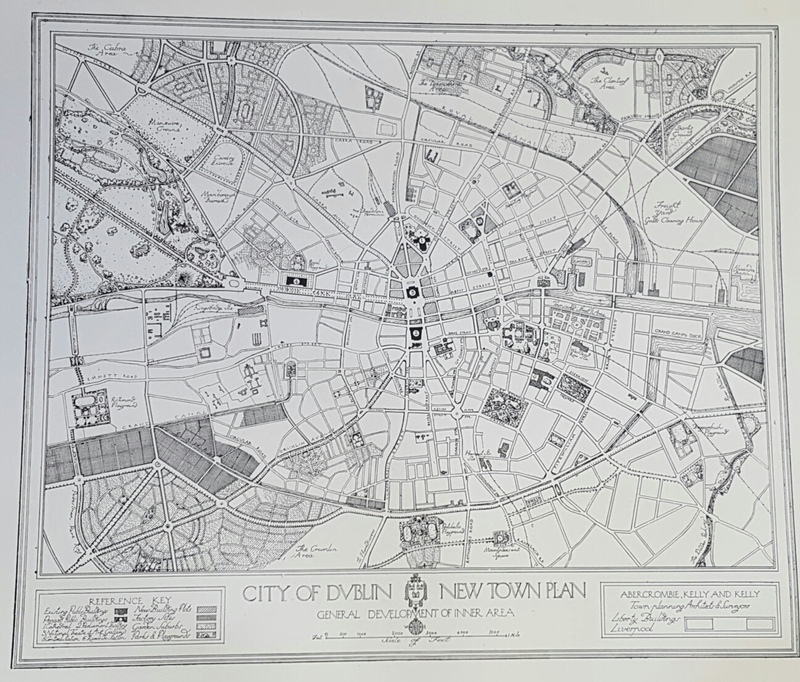 Coming into his own as a town planner following World War II (working on towns such as Oxford, Exeter and Salisbury) that this is likely to be Sharp’s copy of Dublin is a very rewarding aspect of the provenance of the book. Upon first opening the book – the reader is presented with a striking and unusual frontispiece (below). On first inspection – you could almost wonder why this illustration is used as a frontispiece in a publication largely about the technicalities of town planning. 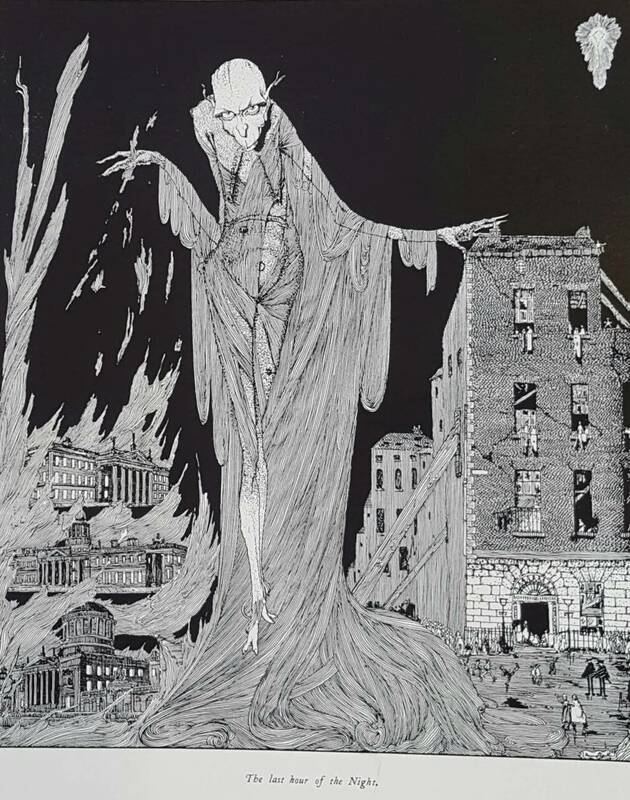 Harry Clarke (1889-1931) was born in Dublin and worked as a book illustrator and stained-glass artist. Clarke was also a prominent figure in the Arts and Crafts movement in Ireland. Clarke’s The last hour of the night makes plain to the reader the damage incurred by the city during the preceding years of war and battles for independence. It is a haunting image that alludes to the challenge faced by Abercrombie and his team to rebuild, redevelop and reinvigorate the city. Few towns have suffered a change, physical and psychological, during these intervening years of war, trade boom and subsequent depression: but Dublin has added the double tragedy of war and civil war within her gates. (Dublin of the future, p. ix). You can see Dublin of the future in full here. Find our more about our Landscape Institute collections here. Science Engagement Officer, Robyn Hopcroft, reveals what we got up to at the Big Band Lunch on Sunday. Last Sunday we enjoyed glorious weather and fabulous big band music at the University of Reading’s annual Big Band Lunch. This was a chance to bring the University and local communities together over lunch, and celebrate the University’s 90th Anniversary year. 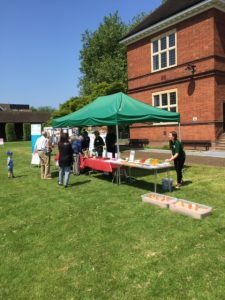 A small team of staff and dedicated volunteers were in attendance and we had great fun running traditional fete games such as ‘splat the rat’ and ‘hook a duck’. Our seed press in action. Apparently our sunflower oil was far tastier than the store-bought variety. But the theme of the day was food and music, and we were especially interested in chatting to people about food. Where does it come from? What’s it made of? Why do we eat what we eat? 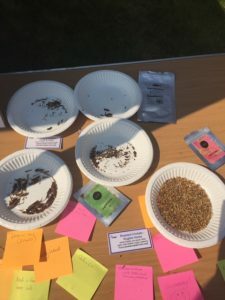 By getting hands-on with activities devised for The Crunch programme, such as oat rolling and sunflower seed pressing, we were able to have some great conversations about the history and nutritious properties of oats and edible oils. 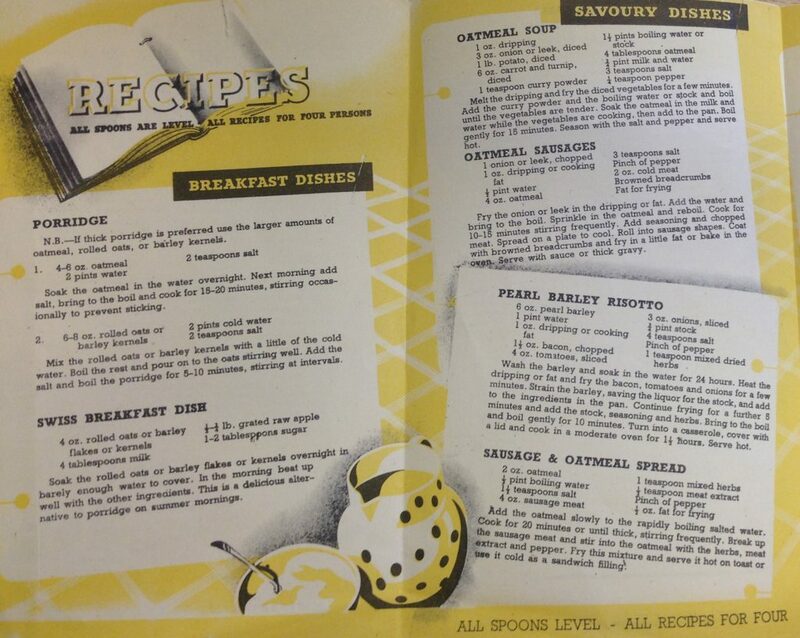 Ministry of Food recipe leaflet (1946). 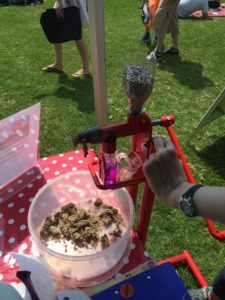 Visitors were able to roll their own oats and take away some contemporary and vintage recipes for inspiration. We even received some help from human nutrition staff and students and it was a great opportunity to find out more about some of the cutting edge research being conducted at the University. I was pleased to be able to meet and chat to scientists studying some of the potential health benefits of phenolic acids in oats. Phenolic acids are found in many plant-based foods and play a role in heart health. Getting involved in these kinds of studies as a research participant can be great way of learning more about the work of scientists, especially given that we tend to receive sensationalised messages about nutrition and health research from the media. Unfortunately, I don’t qualify for this study – they’re recruiting male participants. 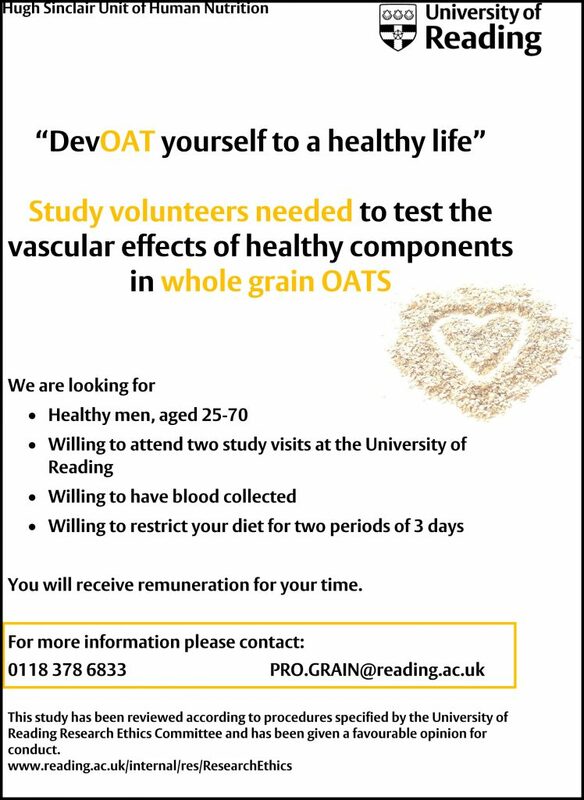 But for any men who are reading: the PRO-GRAIN team are looking for some healthy males willing to eat oats for the sake of science. Insects proved to be a popular snack choice for visitors to our stand. 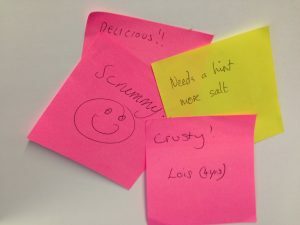 Some mixed opinions on our edible insects. Our edible insect challenge was one of the stand-outs of the day. We wanted to encourage people to think about the growing population and consequent increasing demand for protein. Edible insects are a cheap, nutritious, protein-rich food, and a common snack in many parts of the world. This brave fellow ate one of our giant water bugs – not for the feint-hearted! But it wasn’t all about snacking on whole insects – wings, legs, antennae and all. We also considered less confronting ways of consuming insects by holding a brownie blind tasting. People sampled brownies from two trays – one batch was made with wheat flour and the other was made with a mixture of wheat flour and flour milled from crickets. Which ones are cricket flour brownies? 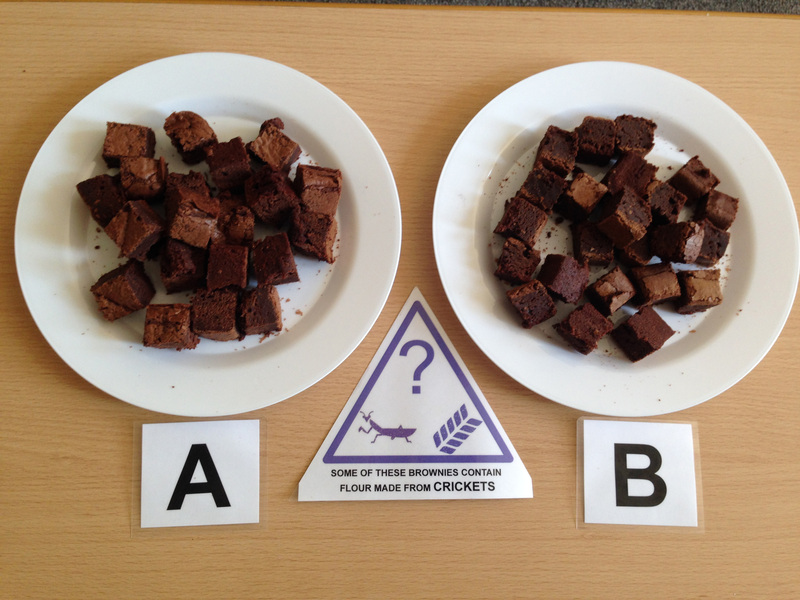 Tasters were asked to guess which plate contained cricket flour brownies. I can now reveal that it was PLATE A! We’ve tallied up the responses and found that 60% of people made a correct guess. Most people, myself included, seemed to think that while the wheat brownies and cricket brownies tasted different from each other, they were both delicious and there wasn’t an ‘insecty’ taste to the cricket brownies. All in all it was great day out. We were busy but we had lots of fun. Many thanks to everyone who was involved. And the fun fact that I learned for the day? 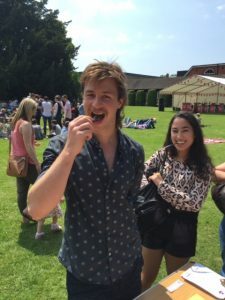 The people of Reading are well up for the challenge of munching on insects! 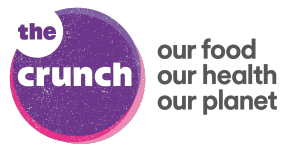 Learn more about edible insects at The Crunch. What does your job entail at MERL? I’m split between working in the reading room and doing background tasks. Three days of the week I’m down in the reading room answering enquiries, doing production, getting documents out and generally helping researchers with anything they need. And then the other two days I work on various archive projects . How do you think those two separate areas of your work compliment each other? I don’t think I would have come across half of the interesting stuff in the collections if I didn’t do the enquiries. A lot of the time we find items because somebody has asked for a something specific. If it’s more obscure we do a bit of digging and that’s when I find some amazing things I wouldn’t have known were there unless I had trolled through the catalogue! As a result I can pass these findings onto other interested reading room visitors. What type of people have you seen make use of the research material? Undergraduates, Masters and PhD students, museum staff doing their own research and the public with general interest. The fact that we’ve got some local collections probably draws people in who are interested in family history, who might ask ‘I’ve got this photograph can you tell me more about it?’ So you get a lot of people coming in from different angles. Has anyone enquired about whether you can help trace their ancestry or lineage through a photograph brought in? Yeah, I’ve had a couple who have been distantly related to some of the aristocratic families that we’ve got farm records for. A lot of people ask about relatives who worked for big companies like Huntley and Palmers and we’ve also got Rolls of Honour from service in the military. Most of the time they’re a really good place to start. If they served then they’re probably guaranteed to be listed. What are some of the rewarding aspects of working within a cultural heritage environment? I got into this because I was shown an archive document many years ago and I just thought ‘that’s amazing’. I wanted to make people feel the way I did the day I looked at that archive document, and help them discover things they’ve never seen or thought existed. Before Christmas a reader was looking through the Nancy Astor Collection and they came across some really interesting letters. Just to hear them chuckling at the table confirmed they had found something exciting. I think they actually wrote a blog post about it for us. How do you find it working in a small team at MERL? Yes, definitely they’ve got such a wealth of knowledge and experience that I’m always able to go to someone and say, ‘I don’t suppose you know anything about this’ and usually they have an answer. From that respect it’s really good. And it’s a nice environment because everyone is really helpful and eager to collaborate which is a great thing. Did you study your degree with the hope of working in a museum one day? I’ve wanted to work in this sector for years. I did work experience in my local archive and library in my GCSE years. On the last day the Archivist showed me a mortgage document on vellum and I just thought ‘that’s what I want to do’. So I went to University in York where there are so many different places you can do heritage and archiving volunteering. After graduating I came to MERL for an internship. I then moved to Network Rail’s record centre working in records management. I’m due to start the Masters in Archive and Records Management this September at UCL; it’s finally coming to the point of getting the professional qualification. Whilst working here have you been able to discover your niche? I’m still finding it. It’s so varied and I don’t have enough experience of different repositories as yet to say where I want to go. Every place has so much different material and so many interesting bits to it that I haven’t quite found the niche yet. It might take a few years but I’m definitely on my way to finding it. What is that one thing that makes individuals who work within a cultural heritage get enthusiastic about what they do? Passion. We all just generally love what we do on a daily basis. I don’t know how common that is in any other work place but within the museums & heritage sector it tends to be quite prevalent. I have been to a number of archive trainees meetings with people within similar job roles to mine and we always end up chatting for a good couple of hours afterwards, mostly about our work and what we’re doing. Overall, it’s a really good, collaborative environment. Do you think enough work is being done to encourage people to learn more about museums? I think we’re lucky in this country to have a good supporting nature towards our heritage. However, there are still sections of society who don’t necessarily interact with museums in any way. But I think MERL is a bit of an exception because it does a lot to increase the profile of heritage work, and the volunteer and outreach programme here is amazing. So I think MERL is an organisation that does a lot to help promote the values of museums. Whitney: So it’s really more about looking at how museums show keen interest in and interact with their local communities. Ceri: Yeah, I think MERL is really good at that! 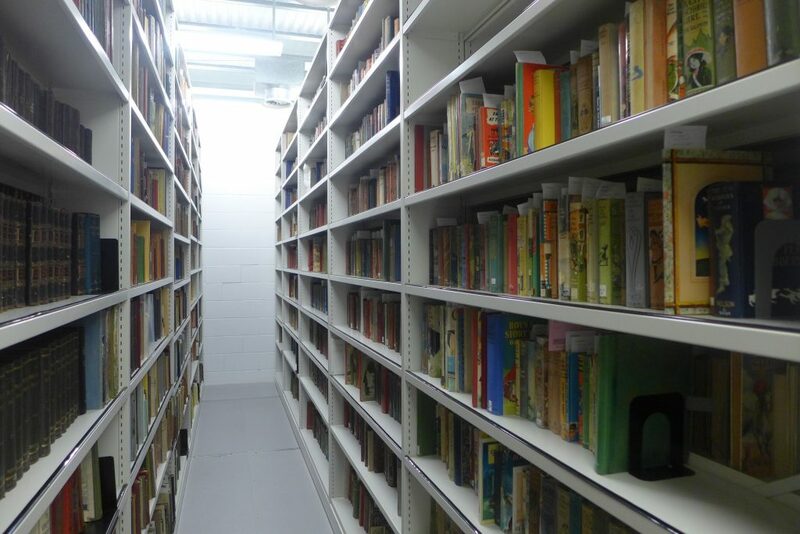 Are there any places you can learn about culture heritage and history around Reading? The town hall, Museum of Reading, the Berkshire records office which we direct a lot of people to if it’s a local history question and we don’t necessarily have the answer. There are also a couple more sites like the Reading Abbey ruins, located near Forbury gardens. The John Lewis heritage centre is also 20mins by train. There are quite a few places in the area but you don’t realise just how many there are until you start looking. Do you think it’s always better to have a museum related degree before making the transition into museum work? It probably helps but whether it’s essential I’m not entirely sure. I did a degree because I really wanted to study history. I was a bit of an exception in that I’m probably the only person out of my group of friends in University who has actually used their history degree in a history related area. A lot of the enquiries involve research and using catalogues which I probably wouldn’t have come across as much if I hadn’t done a degree. So from that side of things I think it helps for the practical things. How do you think museums will change because of the online space and everything being digitised? I think people will always want to come into the museum and have a look through the actual stuff. It’s a different feeling from looking at something on a screen. It’s part of the fun. However, digitisation helps a lot especially with photographs. During my internship here a couple of years ago I worked on some of the local photograph collections and got to zoom in on photographs and see specific parts of images that you wouldn’t necessarily see if you were looking at the hard copy.